Be the first to share your favorite memory, photo or story of Thirsa. This memorial page is dedicated for family, friends and future generations to celebrate the life of their loved one. 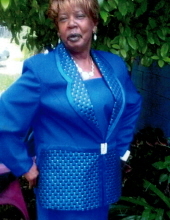 Thirsa Lee Buford Clack was born June 7, 1957 in Lakeland, Florida to the late Albert J. Houston and Thirsa Lee Houston. She was married to Kenneth Clack for many years. She was a loving mother, sister and wife. She leaves to cherish her memory a loving family of children, siblings, and grandchildren. She was called home on May 27th in Lakeland at her earthly home. To send flowers or a remembrance gift to the family of Thirsa Lee "Tina" Buford Clack, please visit our Tribute Store. Mission Possible Outreach Ministries, Inc.
"Email Address" would like to share the life celebration of Thirsa Lee "Tina" Buford Clack. Click on the "link" to go to share a favorite memory or leave a condolence message for the family.